I'm not known for my craftiness. The fact that I made bird feeders out of milk jugs was a huge accomplishment for me when it comes to crafts. But when I saw these Chalkboard labels, I couldn't get over just how cute they were. And I thought, surely even I could could create something cute with these. First of all, there are several sizes and shapes to choose from. 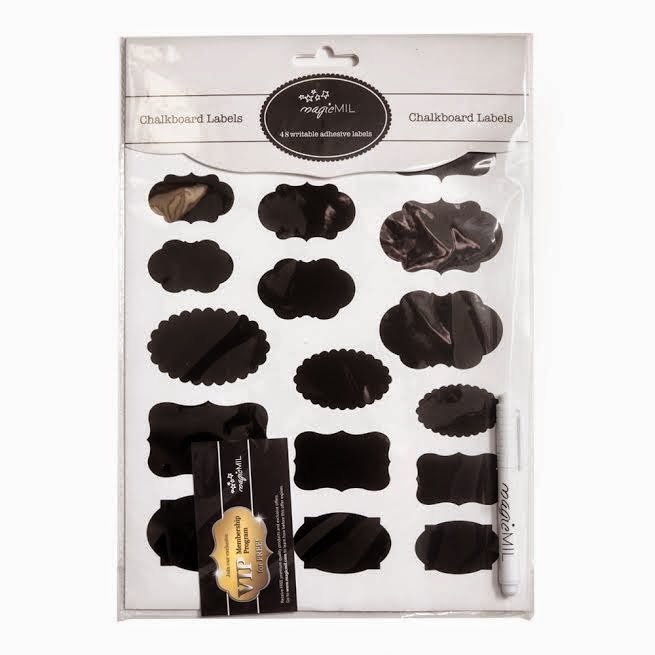 So the possibilities seem endless for what all you could do with these great Chalkboard labels. They are easiest to remove if you slightly bend where the label starts. And they are also re-positionable. (I may or may not be speaking from experience ;) But they can be re-positioned up to 20 minutes. And they come with a liquid chalk pen. The liquid chalk pen is a little more watery than other markers. You can reapply to produce a thicker line. You could also use regular chalk or a white permanent marker. But within minutes, these are the two labels that I created to use in my kitchen. And this is just the beginning as I could see these being used for lots of things in the kitchen, but also the bathroom or even a kid's room, or storage area, and the list goes on and on. Really, the possibilities seem endless for the uses for the Chalkboard labels. And I would like to offer you a 40% off coupon so that you can try these out for yourself. Just click here to use your discount. And three of you, that's right, three of you can win your own package of Chalkboard labels. Only one package per person. US residents only. The giveaway ends October 2, 2014. Please, I need your click. Please click the banner to give me a 'vote'. Thank you in advance. I am doing a project right now that those chalkboard labels would work out great for. My Daughter would like these too. Those are super cute. I can think of a million places around my house where I can use those. I love that chalkboard has made such an impact on people! Its awesome! These labels are awesome! I love chalkboard labels. That make kitchen items look pretty rustic and antique. These labels are so cute. I totally want them. I am loving all the chalkboard labels. These look SO awesome! Oh, I really like this. There are a bunch of ideas in my head on how I could use these around my house! I love these and I'm sure my girls would snag them from me for their AG dolls! I see so many gift idea opps for these. I really like these chalkboard labels because you can use them over and over. They look really nice too. These are so cute! I would love to have some jars on my desk for pens, pencils, erasers, etc. I love this idea! These are absolutely adorable! I could use them in so many places. Those chalkboard labels are awesome. I love this idea! The chalkboard labels are adorable. I would love to have them all over my kitchen. I collect old glass jars and these would be perfect! I dont' usually join giveaways but this one I did! My daughter would love these. She is a label junkie and with the twins coming soon I am sure she will be needing lots and lots of labels! This is giving me so many creative ideas. So many great stylish labels. I love chalkboard labels. I use them all the time.